There ain't no secrets to outshine, father time." 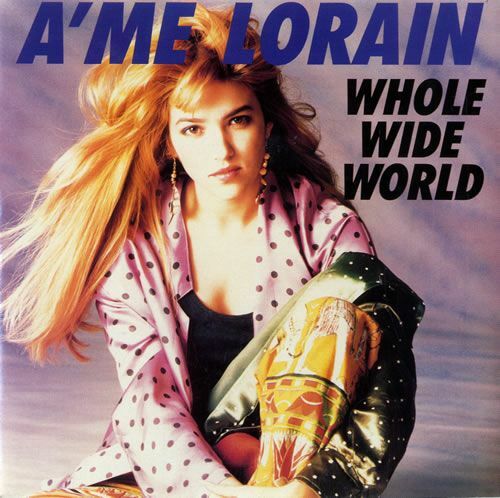 I can remember walking into a Listening Booth store in the middle of my local mall and flipping through their one rack of 12" dance mixes of freestyle/house music and finding a copy of A'Me Lorain's "Whole Wide World". I bought that and a copy of Lisette Melendez's "Together Forever" and felt like I hit the music lottery. Back in 1990, in the middle of suburban Pennsylvania, club music was a novelty rather than a standard. I was 90 minutes from Philly, two hours from NYC and basically just far enough out for stores not to carry a whole lot of dance stuff. I was still glued to Dance Party USA and my friends from the series so I knew what was popping in the clubs. I found a way to get my hands on Judy Torres and Coro even if I had to order it. But A'Me Lorain was an unexpected find and I played this record into the ground. She is still around, in case you were wondering. She dropped a dance track last spring that didn't do much chart-wise, in spite of getting a bit of club play. You can check it out here. In the meantime, revisit "Whole Wide World"!